For my college intro to Aerospace course (Mechanical and Aerospace Engineering, MAE) I was given the choice between a balsa wood glider project and a near space balloon. Needless to say, I went for the balloon. 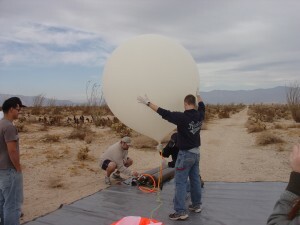 Seeing how the launch we had just completed with the under-represented high schools didn't turn out too well, everyone was doing their best to make sure the payloads would be there when we finally retrieved everything. Command: Decide on the launch location, create check lists for launch, organise launch day tasks, organise the retrieval of the balloon, run flight simulations, coordinate tracking. 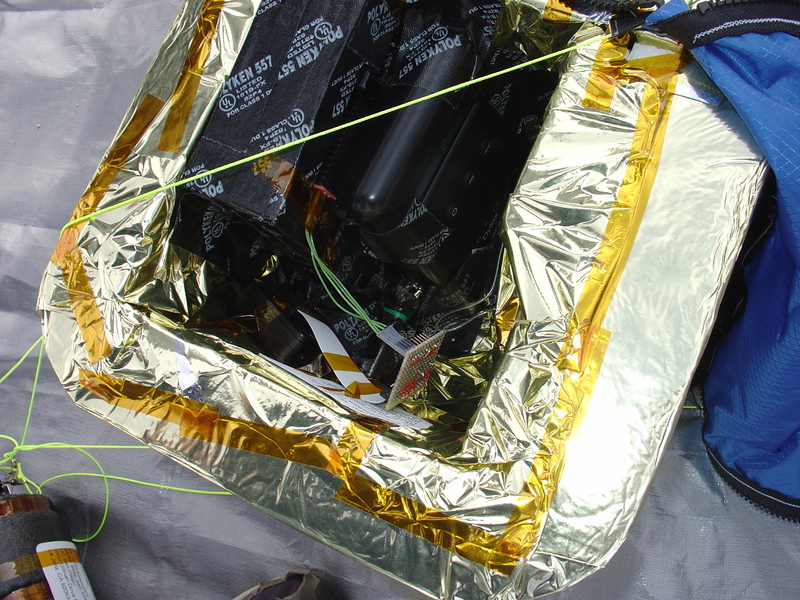 Structures: Design, create, and test the balloon payload and harness structures. Very essential, considering the tie lines had snapped on the previous launch. Camera: program 6 Cannon cameras, arranged in a hexagon, with CHDK, and get them to take pictures simultaneously. Bio: Come up with and create a biological experiment to be sent to near space. It ended up being brine shrimp eggs (sea monkeys). 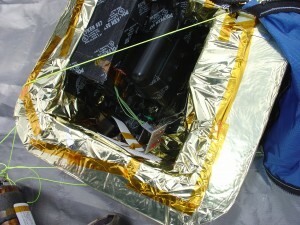 Atmospheric Sensors: Take sensor readings of atmospheric data, and analyse it upon return. Extra: Come up with an additional experiment which can be run on the craft. They ended up using a particle counter with a video camera trained on the output screen. I was put in charge of the atmospheric sensor team and helped out everywhere else I could. We decided to work towards setting up a system which would measure internal and external temperature, humidity, pressure, acceleration, magnetic field, and battery percentage. 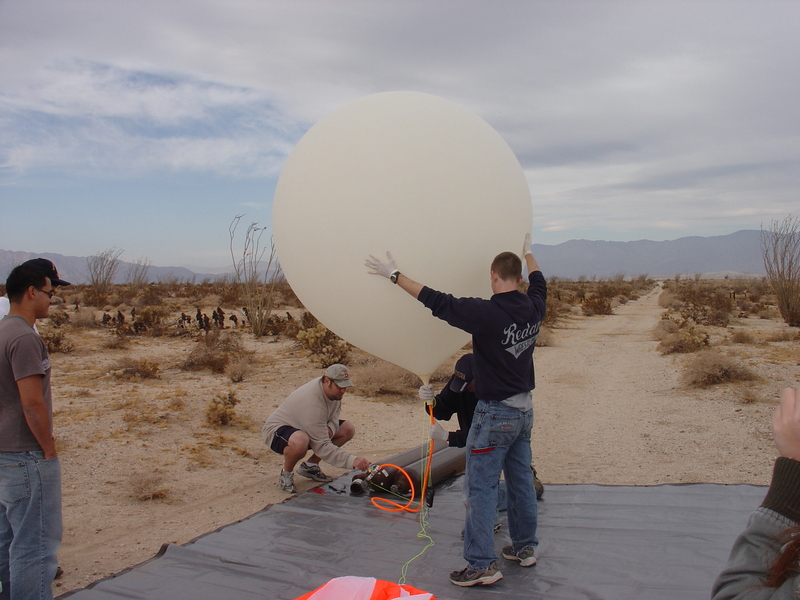 Originally we looked into measuring UV radiation and/or sending up solar panels, but the UVA / UVB sensors were poorly suited for sending up on a balloon, and we simply did not have enough time to set up solar panels. The SCP1000 barometer did not work too well on Apteryx, so I started work on getting something to replace it on this flight. I settled on the SM5812, a barometer used by the guys at nearsys.com. We used Sun SPOTs again, and this time I was a bit better about the soldering. We used ribbon cable from circuit monkey to connect headers on the spot to a protoboard, and exchangeable sensor connectors for a modular design. The whole thing fit together quite nicely, and I expect to use it again in the future. Each spot, of which there were two, was fitted with an SHT15 temp / humidity sensor. One was configured with the SCP1000, the idea was to set up the other with a MicroMag 3 Axis Magnetometer from Sparkfun. The SCP1000 worked after a bit of messing around with the data sheet, and nearsys had a nice info page on their site to help out. For some reason, I couldn't get good readings from the sensor, which was supposed to give its digital reading in volts from .5 to 4.5, 4.5 being the value at sea level (15 psi), 0.5 being zero pressure. Instead I was getting 3.7 in San Diego, which was quite far off from expected 4.5 of sea level pressure. 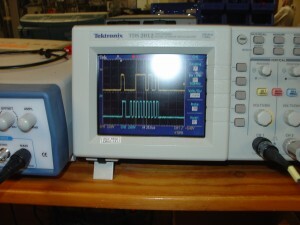 An oscilloscope verified that my code was handling the data from the sensor correctly, and a measurement of the analog signal from the sensor actually showed 4.3 volts. I was not able to get an analog measurement working in the final few days before launch, and I would very much like to do that next time. However, the digital reading did scale with pressure, and I measured it at various pressures and did some math to correlate it as best I could. 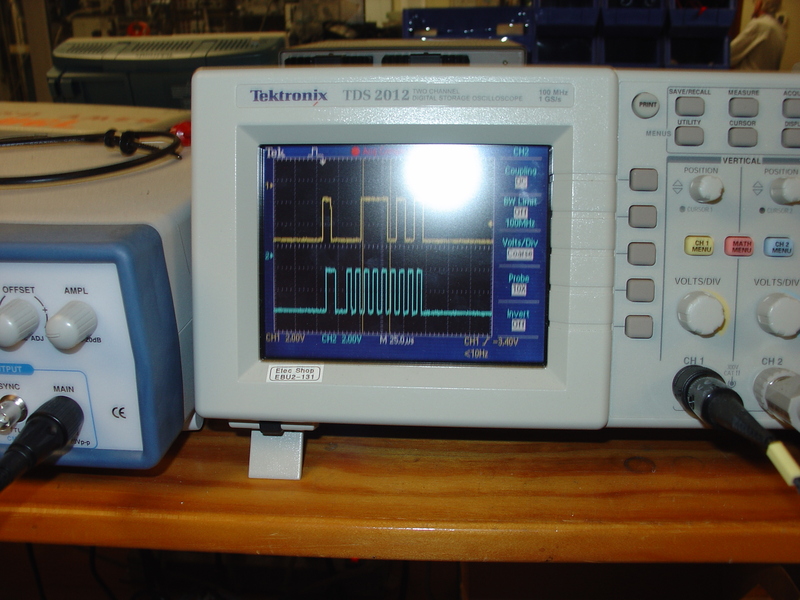 Here you can see the I2C communcations at work. 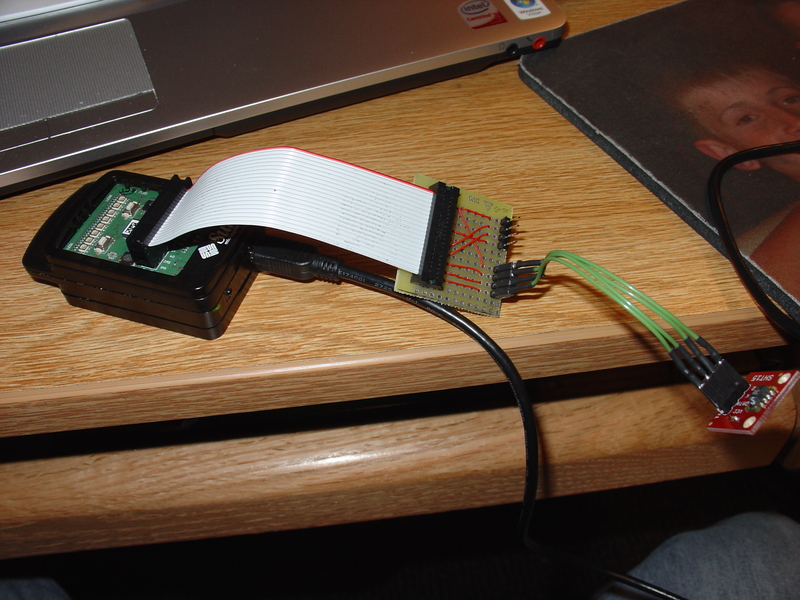 The magnetometer was quite difficult, particularly due to its SPI interface. Tyler, one of my team members, had the idea to set up an interpreter / middle-man between the spot and the sensor to use I2C with the spot and SPI with the sensor. We stayed up pretty late to get this together, and it was not finished before flight. The spots were set up with the same flight code, each taking the reading from its external sensors, as well as battery percentage, onboard temperature, a time stamp, and net acceleration. 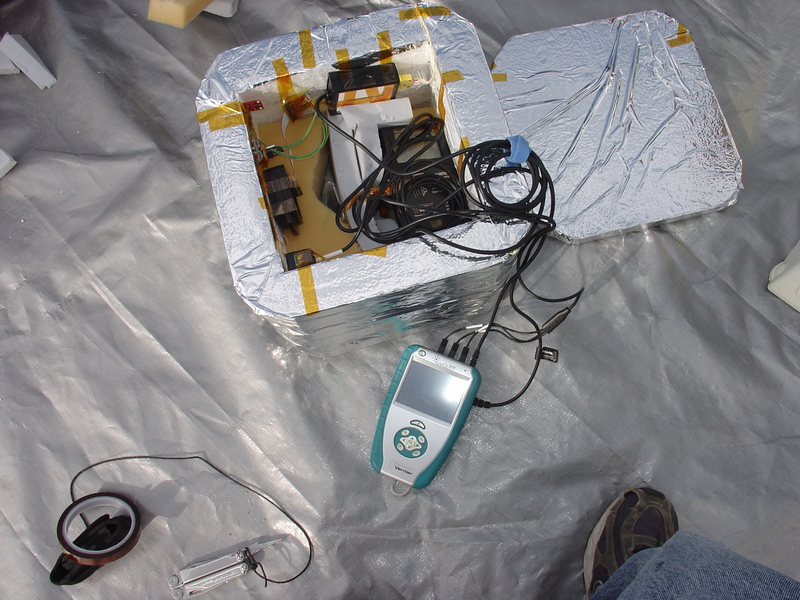 Professor Kosmatka had a Vernier data logger we were allowed to use, which let us send up a digital radiation sensor, a thermocouple, and a 3 axis accelerometer. Setting this stuff up was a piece of cake, but it did take considerably more room than the Sun SPOTs. We finally retrieved everything, and afterwards realised we had been in a bombing range. Oops. We got all of the sensors back (spots still running), but the Vernier was frozen (in the software sense) and doing weird things with the display. We plugged it in (seeing as it was very low on power), and I got all of the data off of it back in my room. It worked fine after it got a reboot. For those interested in data, or a more detailed overview, check out the report we wrote here. Pictures I took can be found here, and I will post more once I get them from my professor. This entry was posted in Uncategorized and tagged Near Space Balloon. Bookmark the permalink. Code is here: http://kenai.com/projects/hibal-spot .